Happy St. Patrick’s Day from St. Patrick’s, Esker, Athenry! We wish you a truly blessed and happy celebration of the feast of St Patrick, on this Sunday March 17th, 2013. God bless you all! 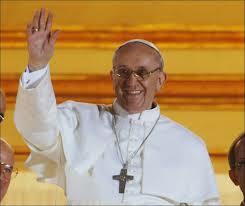 We all rejoice in the election of our new Pope, Pope Francis. God bless him mightily in his ministry for God’s people today! For reflections on St. Patrick on this feast day, See Soul Food for Hungry Adult Communities, and Soul Food for Young Adult Communities, on this site. Go to Soul Food on Carousel. 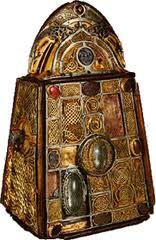 Shrine of St. Patrick's Bell, in National Museum of Ireland. Christ when I arise, Christ to shield me. P.S. And on this day, we remember two Irish Redemptorists who set out in 2010 to begin a new Mission in Northern Mozambique and soon into Malawi. Their names,- Fr. Brian Holmes (in his 60′s), John Bermingham (in his late 30′s). They are learning Chichewa, a local language spoken by 15 million people! They are two among so many! God bless them, in this new venture of the Irish Redemptorists.